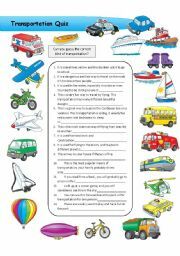 This simple worksheet was made to check my kid´s ability to understand the difference between the words Ever, Just, For, Since and Ago, which are all words we learned while mastering the present perfect. Instead of having the students show that they have mastered using these words, this is just to check initial understanding. 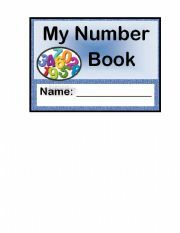 This is a simple board game to practice conversation. The theme is music. The questions are taken and some are adapted from http://iteslj.org/questions/. Enjoy! I took definitions I found on Wikipedia in English to create this worksheet where students will match definitions to the names of the sports they describe. 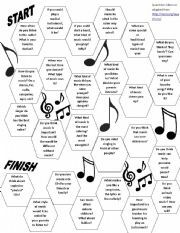 An easy fill in the blanks activity focusing on kitchen items and food containers. 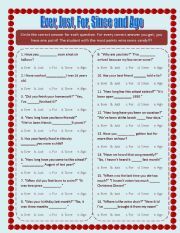 This is a simple worksheet used as an introduction for kids to practice with the positive and negative forms of "was/were". 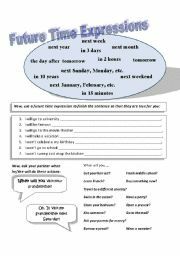 It is easy and doesn´t involve any questions, so could be used the first day of learning the verb to be in past. If we finish our work, we will play! I could not find a simple introduction to the first conditional for my kids, so I made this one. 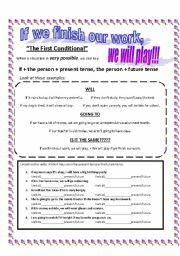 It shows some examples with Will and Going To, and then has them only identify the verbs and if they are future or present tense. It´s very easy to follow! This is the simplest way I could think to introduce ONLY future time expressions. The worksheet only deals with the future WILL form, and not going to, so that it is simpler and truly only focuses on the new time expressions,and not the grammatical structure.